In a heavy-bottomed frying pan add the oil. When hot, add the onions, garlic, and salt and pepper and cook over medium-low heat until tender, about 5 minutes. Add the brussel sprouts and turn up the heat to medium high. Stir frequently until the sprouts are golden on the edges ( about 5 minutes). Use a large spoon and make 4 wells in the sprouts. Crack an egg in each well and cook covered with a pan lid or foil for 2-3 minutes until the egg is set. 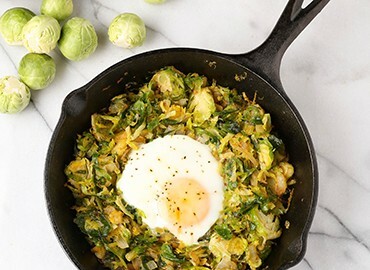 Divide into 4 servings giving each person an egg and some sprouts.